Responding to the ErP challenge — Adrian Morris. With tighter regulations relating to space heating coming into force in 2018, implementing a proactive boiler replacement programme is more important now than ever, says Adrian Morris of Remeha. Summer is a particularly good time for building managers to identify and carry out refurbishment projects ahead of the colder months of the autumn and winter. As heating typically accounts for around half the total energy use in non-domestic buildings, this critical service offers huge scope for efficiency measures. Boilers are a case in point. A large proportion of the UK’s non-domestic buildings rely on this tried-and-tested technology for their heating and hot water generation. But boiler operation varies widely from building to building. While the latest condensing boiler models can deliver near-maximum gross efficiencies and high performance, non-condensing boilers that are 10 to 15 years old might achieve at best only 70% gross efficiency and high emissions, even when well maintained. 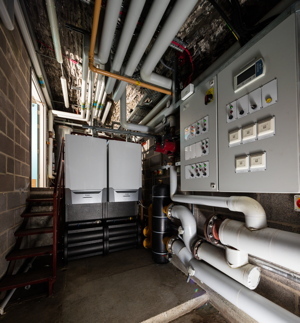 Routine replacement of ageing or inefficient boilers can therefore significantly improve both the building environment and its sustainable operation. And with new mandatory Ecodesign requirements from the Energy-related Products Directive (ErP) set to come into force in 2018, it more than ever pays to implement a proactive boiler replacement programme. By now we are all familiar with ErP. The legislation is part of the European Union’s drive to encourage less-efficient products to be replaced with higher-efficiency, new-generation heating technology across the UK and Europe. As all EU initiatives are expected to remain in force in the UK post-Brexit, it is important to note the imminent changes concerning boiler replacement projects. Tighter requirements regarding energy efficiency have been in place for all space heaters, including boilers, up to and including 400 kW since 26 September 2015. These have effectively made it mandatory to install condensing boilers below 400 kW in new-build and replacement applications — including existing heating and hot-water systems using non-condensing boilers. The one exception to date has been the direct, like-for-like replacement of non-condensing pressure-jet shell boilers or burners, as these were initially out of scope of the regulation to enable spares provision. However, this is all set to change. As building managers should be aware, the window of opportunity for replacing burner or shells for old-style pressure-jet boilers below 400 kW closes firmly from 1 January 2018. When size counts — Remeha’s recently introduced Gas 220 Ace boilers (left) are much smaller than Gas 310 boilers (right). In addition, under the Ecodesign of ErP, mandatory NOx requirements will be introduced from 26 September 2018. This will enforce maximum NOx emissions of 56 mg/kWh for natural-gas and LPG boilers and 120 mg/kWh for oil-fired boilers on both new-build and replacement projects. The EU predicts that refurbishment projects will benefit from a reduction of around 20% in energy usage and bills due to the higher efficiencies of ErP certified products. And with buildings and their heating systems typically emitting NOx, enforcing mandatory emission requirements from heating is an important step towards achieving cleaner air. But what impact will this have for building and asset managers? Well, when it comes to replacing existing boilers, the tighter ErP regulations could require a switch of technology and/or fuel supply to a more efficient or cleaner heating alternative. A likely scenario would be a transition to condensing boilers operating on either gas or LPG. Switching to condensing-boiler technology can be seamless, but, as with most things, benefits from forward planning. Developing a proactive replacement programme ensures that the refurbishment can be designed for maximum efficiency and minimum disruption. It factors in adequate time for full consideration of design issues such as the condensate and flueing arrangements or the change of fuel source. And crucially, it ensures a reliable heating service for the building at all times. With emergency boiler replacements, restoring the heating service as quickly as possible is essential for the day-to-day operation of the building. Proactive replacement planning, in contrast, builds in time to reassess the requirements of the building and to engineer for maximum efficiency. One example is the opportunity to size the current heat-load requirements. Sizing is particularly relevant on refurbishment projects, as the building and how it is used may have changed since the last boiler installation. Extensions to the building may require an increased heat output, while improvements to the fabric of the building may mean that the current heating plant is currently oversized. 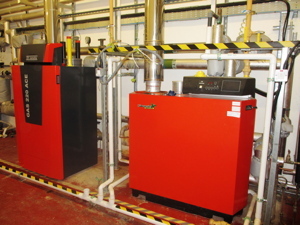 A well sized boiler will simultaneously improve the comfort and well-being of the building occupants and the energy performance of the building. With forward planning comes the chance to select and specify the most appropriate product for the project — and to accommodate this in the budget. Choosing to implement a rolling replacement programme can assist with budget management as the installations can be scheduled in phases. Reduced inconvenience and downtime are further advantages of developing a proactive asset management programme as the staged replacements can be carried out in a live environment. This is increasingly important as a growing number of businesses now remain in operation 24/7. The countdown has begun to the impending tighter ErP requirements. Ultimately, the aim of the ErP is to ensure that only the cleanest, most energy-efficient heating equipment is manufactured, specified and installed in the UK and Europe. And already there are flexible, easy-to-install ErP-certified heating products on the market to meet every project and site requirement. High-efficiency boilers like the Remeha Quinta Ace 160 are future-proofed to all NOx regulations. Forward-thinking manufacturers like Remeha offer a selection of condensing-boiler models that are future-proofed to all legislative requirements. The wall-hung Quinta Ace 160 and high-output floor-standing Gas 220 Ace range, for example, have been designed to achieve high efficiencies and ultra-low Class 6 NOx criteria. These condensing boilers are also certified for operation on LPG, making them suited for off-grid organisations looking to switch to a more sustainable fuel source. With the ready availability of ErP-compliant boilers, backed by specialist product and technical knowledge from manufacturers, building and asset managers have the necessary support to identify the challenges ahead. Improving the energy performance of the UK’s existing buildings is the greatest challenge facing the building-services industry. And ErP might just be the driver needed to increase heating efficiency and comfort in buildings. But it pays to plan ahead. Adrian Morris is product manager at Remeha.